Again, current Infocom IP owner Activision has generously made the ZORK trilogy available for free download here. (And you don't even need to run it in DOSBox, actually -- it works fine for me under a vanilla Windows Vista command prompt.) The free version is Release 17; the series apparently stabilized as it progressed, with fewer revisions required on the later entries in the trilogy. There's no specific authorship credited for this chapter, so we will trust in the fabled Implementors to challenge and amuse us. 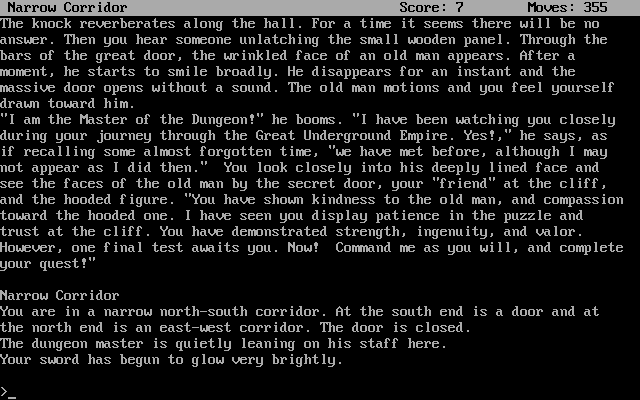 ZORK III picks up right where ZORK II left off, as we emerge through the secret door to face what the introduction calls the final test. As in the trilogy's second title, the familiar lantern is readily available at the start, but the enchanted Elvish sword is embedded in a great rock and cannot be readily freed. Fortunately, we are its rightful owner as far as the Implementors are concerned, and it magically appears in our hand when we encounter a cloaked and hooded figure in the Land of Shadow. We can fight this hooded figure -- KILL FIGURE WITH SWORD must be repeated, and the randomized battle takes a while, but it's not too difficult to manage. When the figure dies, however, we catch a brief glimpse of deep and sorrowful eyes. This might be a hint that it is not wise or good to kill this creature, but the ramifications of our actions will not become clear until later in the game. We glimpse some movement among the trees adjoining the cliffside to the west, and can find some fresh waybread there, which would probably keep any hunger pangs at bay for the duration of the game, if any such pangs were to manifest, which they will not. On the shores of the Flathead Ocean, a Viking-like ship passes by, helmed by an old and crusty sailor; there's a joke and a puzzle involved here, but I didn't figure it out on my own, and it's not entirely necessary, so we'll come back to him later. Indoors, beyond the shadowed ground, we encounter another Engravings Room, with runes depicting flames, stone statues, and figures of old men. We can also discover a wizened man sleeping in a corner, and examination reveals that his eyes seem younger and stronger than his frail body. We can WAKE MAN. Is his body exchanged with the figure who attacked us in the Land of Shadows? Apparently not, at least not in the way I was thinking when I made note of this -- but this too foreshadows the end of our journey. The Technology Museum houses some machines, a jewel collection guarded by an impenetrable cage, and the Royal Puzzle. The intriguing golden machine has a seat and a console, with a three-digit display set to 948 and a single button. We can enter the gold machine and TURN DIAL TO 777; we can then PUSH BUTTON, which at first appeared to crash the game. Then I realized that it simply ends the adventure, with no chance of recovery, as we arrive in another time, surrounded by heavily armed and hostile guards, and are dumped unceremoniously to the DOS prompt. 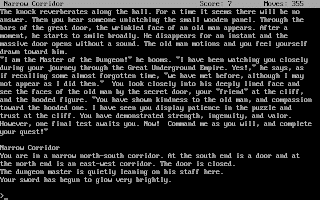 Dying in ZORK III normally acquaints us with an old man who can resurrect us; this is an exception, perhaps due to the nature of time travel itself, taking us beyond his ability to assist. On my first attempt, I somehow opened up the entrance to the Museum and then could not figure out how I had done it. Was it simply a result of exploring? In a way, but not, again, the way I would have thought. The Royal Puzzle is a maze, and a fairly difficult one, but at least a warning note lies at the entrance so we do not wander into it without a chance to SAVE first. Once we are inside, we can PRESS EAST WALL to progress into a visual depiction of the immediate surroundings, drawn as a 3 x 3 grid, coercing the Z-machine parser into presenting a Rogue-like maze in portable ASCII text format. We can move in all eight cardinal compass directions, with no up or down movement allowed; some walls are closed off as others are opened, some are blocked, and it's not hard to push the walls in such a way that we trap ourselves forever inside the Royal Puzzle. A ladder in one section can't be climbed; experimentation establishes that the sandstone walls can be moved, the marble walls apparently cannot, but mapping is tricky because the maze itself is so malleable. If we manage to figure out the maze, or have access to the Invisiclues (yes, I'm guilty! ), we eventually reach a room with a couple of ladders, a room with a steel door and a slot, and another room with a depression in the floor and an old and dusty book. Once I was there, I was again at a loss about what to do, so I reverted to an earlier save and did some exploration elsewhere before returning. Well, the soldiers are still pretty active and we die upon arrival again. So that's not a solution. Let's see... we can only set the dial for three digits. I tried going to 999, but the cage guarding the royal jewels doesn't rust away or otherwise become penetrable. If we travel to 750, 760, 770, and 775, we are too early, arriving fatally engulfed in stone, as the Great Underground Empire's passageways have not yet been hewn from the living rock. But if we travel to 776, we can hear some guards talking outside, and learn that the Royal Museum's construction is still in progress. We can also learn that the grey machine is a Frobozz Magic Pressurizer, and the black machine is a Frobozz Magic Room Spinner. The golden machine is a Temporizer, which we've already figured out. All are supposedly non-working models, but clearly the Temporizer in our own time is not quite non-working. If we listen to the guards, we can catch some non-essential conversation about building Flood Control Dam #3, which we visited in ZORK I. The officers eventually leave the area, and the Royal Puzzle is not yet built. But what to do next? Time to step back a bit and explore some details we haven't really resolved. If we pick up the chest on the Cliff Ledge, a man appears topside and offers to "help" us. We can turn him down; I tried throwing the chest over the cliff, which can be done but doesn't cause it to open. We can let the stranger take the chest and then throw the rope back down to us, but when we climb up we see that now the chest is empty. If we let the stranger pull us back up -- he's a decent enough sort -- he gives us a plain wooden staff from the chest, keeping its other contents for himself. Is this what we want to happen? We can kill him with the sword, and claim the assorted valuables that result, but the wooden staff gets broken in the scuffle. I took this to be a clue that the staff has greater value than anything else here, and we should let the mysterious man make off with his reward. We can also give the bread found near the cliff to the wizened man, which proves to be a wise move -- he takes the waybread and points out a secret door in the Engravings Room. Behind the door we find a red button, a red beam, and a large mirror, introducing a complex puzzle. We can BREAK MIRROR WITH SWORD to reveal a wooden panel. 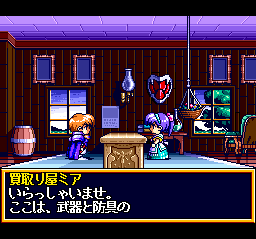 (I also tried to THROW LANTERN AT MIRROR, but that breaks only the lantern.) We can't open the panel thus revealed, though, at least not by hand. I consulted the Invisiclues to learn that if we block the red beam with an object, and then press the red button, the panel opens outward. Now we can reach the Inside Mirror location, which is a fairly complicated room and the core of this puzzle. There's a compass rose here, with a wooden bar suspended in it, mounted on a long pole; the associated arrow and T-bar are initially pointing to the west, locked in place with a shorter pole. We can lift the short pole out of the hole it was resting in, and can then push on the distinctively textured walls of this box to change its orientation. An initial PUSH RED, for example, aims the arrow to the northwest. We can then PUSH PINE to open the panel again. Hmmmm. PUSH MAHOGANY rotates the structure into a fixed position, so we don't have to worry too much about keeping track of the room's orientation, but it can still be pretty disorienting. The room only locks into an exitable position when the compass points north or south. Exiting to the north of the compass structure, we encounter the Guardians of Zork, stone statues armed with heavy bludgeons, with which they will cheerfully kill us if we try to walk past them. I got stumped here again -- I had figured out the mechanics of the puzzle, or so I thought, but was not visualizing something correctly. I consulted the Invisiclues once again, and learned that we can actually travel past the guardians INSIDE the mirror box. This puzzle is pretty complicated. What I was missing is that we can DROP SHORT POLE IN CHANNEL to lock the box into a north-south movement path. But since I've broken the mirrors, the guardians still see us moving and bludgeon the box to a pulp; we need the reflections on both sides of the hall to make our transit "invisible." We can actually open the panel without breaking the mirror (as I had done to discover the panel), and after we push the box to the north end of the channel, we have to rotate it again so the arrow points south in order to safely exit. The Guardians will destroy objects thrown at them, so in theory it's possible to figure this out without dying, but probably not likely. This arduous journey, short on distance but long on head-scratching, brings us to the Dungeon Entrance, where the wooden door has a barred panel but the parser dictionary doesn't seem to recognize BARRED PANEL as an object. We can, however, KNOCK ON DOOR to summon an old man, who tells us to go the secret door and SAY "FROTZ OZMOO." He also warns us about the double quotes -- thank you, playtesting! -- and warps us back to the Button Room. The magic word can be used to warp us past the Guardians in the future, which is handy as apparently we're not yet ready to assay the Dungeon itself. I stopped at this point to take stock of my progress, and learned that my SCORE was presently 4 of a possible 7. 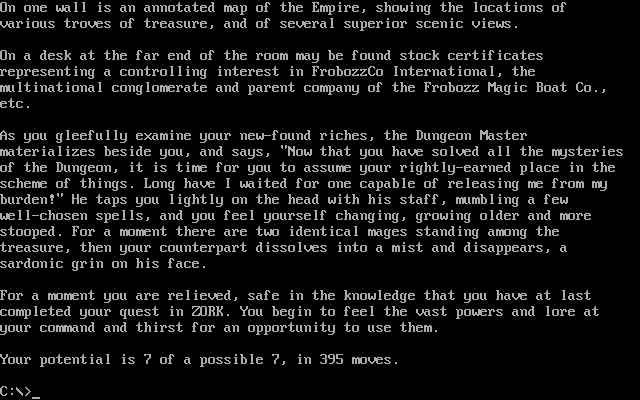 ZORK III is not a treasure hunt like the first two games; there are only 7 creditable objectives in this one, and each point is hard-won. Back to exploring. In the Aqueduct View area, entering the lake we find the water ice cold, and are forced to drop all of our possessions into its depths. So a swim is not a good idea. From the Western Shore we can access the Scenic View, which is an indoor location containing a torch and an empty table; if we hang around, we will see that an indicator above the table flickers briefly, then, for example, depending on the timing of our arrival, cycles from Roman numeral II to III, to IV, and then back to I. There's a torch here, and a table that appears blank until we look at it to see images of ZORK locations familiar and otherwise. While the indicator reads III, we see an image of a wide room with passages leading east and northeast, which sounds very like the Damp Passage room. Indicator I displays a passage with cluttered timbers and a narrow opening, which I took to be ZORK I's Timber Room; II shows a tiny room with rough walls and the number 8 chiseled on a wall; and IV displays a temple with a blood-spattered altar. But there doesn't seem to be anything interesting going on in these locations, so we'll go explore some more. We can access the southern shore of the lake by swimming across, being careful to leave our inventory onshore -- but that route shortly leads us into trouble, as we encounter a veritable grue convention in a dark passage. We need to get some light in here, or find some other solution. We can go swimming in the lake, but a giant roc shortly comes to visit and summarily snatches you in its jaws and has you for lunch. So that's not a productive exercise either. I consulted the Invisiclues again, to learn that in this case I had the right idea at the Scenic View but the wrong verb. We can TOUCH TABLE to go to the location depicted; I was trying and failing to ENTER TABLE, which is, I admit, a very different sort of action even if the metaphor is more appropriate. We can travel this way, but can't explore very far -- we are given only a few turns before being transported back to our starting point. 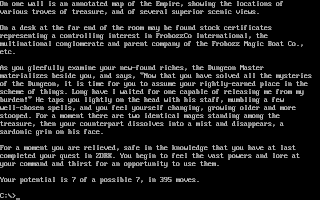 Room IV is actually the Sacrificial Altar from Enchanter, another series Infocom was launching when ZORK III was in progress -- and fatal to visit, so consider it a subtle in-game advertisement. Aha! There is some Frobozz Magic Grue Repellent in Room 8. I get the impression that the Roman numerals on the Scenic table correspond to the three ZORK games, but I don't recall seeing this room while playing ZORK II. Perhaps it lies to the west of the Carousel Room. At any rate, if we apply the repellent to ourselves, maybe we can get through the southern cave without light. It does allow us to survive the cave, but it doesn't last long enough to get anywhere interesting, and we can only apply it once. Can we get the timber from ZORK I and use it to float across the lake without dropping everything? Nope. Further exploration establishes that with grue repellent applied, we can just manage to get S and U (aha!) in the cave off of the southern shore, to a Dark Place with dim light from the east. The Key Room contains a key lying in the dust and a large manhole cover, through which we can enter the Aqueduct. It is however, not easy to leave it, but we can't go back the way we came. Hmmm. The key we picked up is listed as A strange key in inventory, and seems to change shape constantly. So it seems we must restart and access the Water Slide prior to the earthquake. The slide takes us to the Damp Passage -- we need to leave the torch there before going through this section, so we will have light waiting for us upon our return. Whew! What other mysteries remain? We can remove the hood from the hooded figure we met at the game's outset to see... your own face, weary and wounded. Then the figure fades away, leaving its cloak. We can wear the cloak and hood, but is there a reason to do so? Invisiclues time again... we have to say HELLO SAILOR to the Viking ship's captain! Finally this running gag comes into play; but how is anyone supposed to even suspect this without playing ZORKs I and II? At any rate, the sailor comes close to shore, saying, "I have waited three ages for someone to say those words and save me from sailing this endless ocean. Please accept this gift." The grateful seafarer leaves us a vial; OPEN VIAL reveals a heavy but invisible liquid. If this is an invisibility potion, it might be another way to sneak past the Guardians of Zork, but it's not strictly necessary so this puzzle is optional. I did try to use it to evade the guards back in GUE 777, without success. Time for some more experimentation. We can BURN TREE with the torch, in which case Smokey the Bear puts out both the fire and you, in what I assume is an unauthorized cameo by Mr. the Bear. I needed a detailed walkthrough to get back out of the Royal Puzzle; finding the exit scores a point but doesn't really help us finish the story. What else? The Infocom Invisiclues always contain some general questions about things we may not have done yet, which can be very helpful for the more difficult adventures. I thus learned that we can actually MOVE the time machine to the jewel room. Another case of bad assumptions on my part! But the robot who starts working at the museum in 948 tends to move the machine back to its original location, so we can't use it to sneak in and snag the treasures. We can, however, score a point by hiding the royal ring under the seat of the time machine in 776, before the cage is in place, and then retrieving it in 948 -- the ring's companion treasures, the sceptre and jewelled knife, can't be hidden this way, and moving them tips off the guards, causing the machine to disappear from our time period and ruining the whole setup. It's wise to save game before trying to solve this puzzle -- it's still risky, as a guard randomly enters and kills us, so it may take a few tries. It's possible to get all seven points without even assaying the Dungeon, but the storytelling is nudging us in that direction. But when I returned there, I learned that I was still not ready to enter the dungeon. So what was I missing? The magical key changes shape and will not enter the keyhole. The InvisiClues (once again) hint that we need to match the dungeon guardian's costume; examination of his garb indicates that I am apparently missing an amulet. Aha! I had tried to SWIM DOWN in the lake, and got nowhere, but we actually have to DIVE LAKE. Now we can spot Something shiny Underwater, and GET SHINY OBJECT to retrieve the amulet. Now the Dungeon Master allows us into the dungeon, and accompanies us for the story's conclusion, which takes place in and around a tower with a cell door at its base. The Sundial at the Parapet can be pointed at numbers 1-8; pushing the adjoining button seems to close the cell door, if it's open; no other result is apparent. The Dungeon Master won't enter the cell; we can enter it ourselves, and direct him to go press the button, but then he is too far away and we can't call him back to open the door so we can get out. And now the door unlocks, and we become the Dungeon Master, fulfilling the destiny hinted at along the way. It may be a mixed victory -- the DM does not seem particularly thrilled about this line of work -- but we've earned all 7 points, and the ZORK trilogy is complete! There are later ZORK games, which I will likely tackle eventually. But the original trilogy remains a fine example of the classic text adventure -- funny, challenging, engrossing, frustrating and obtuse. Anyone with an interest in games as an art form needs to at least sample the world of the Great Underground Empire. No gaming education is complete without it. WiiWare -- One new game and one free demo this week. FAST - Racing League is a futuristic racer with more than a few ideas and elements borrowed from Psygnosis' classic wipEout. There's also a free downloadable trial version of BIT.TRIP VOID, another in Aksys' retro-style series. Wii Virtual Console -- Hudson continues its Virtual console support with the SNES game Super Adventure Island, another in the popular series that also put in appearances on the NES and TurboGrafx-16. DSiWare -- Three new games this week, but the 3DS shop is still coming soon. House M.D. - Globetrotting puts the characters from the popular TV series House into a T-rated investigative crime-solving game. B Team - Episode 1: Dust & Steel is the first of a planned series of isometric-perspective squad-based shooters. Valet Parking 1989 is a humorous 80s-themed driving/time-management/puzzle game. XBox Live Arcade -- One new game last week - Dungeons & Dragons: Daggerdale, an action/RPG set in the classic role-playing universe's Forgotten Realms environment, with multiplayer support. It appears to be an attempt to do what Baldur's Gate did so well, and it's been a while since an official D&D game was released, but critical reaction has not been kind to this intended first game of a trilogy. PS3 on PSN -- What is going on here, Sony? There's been nothing for the month of May, although the month does still have a few days left in it and the last day of the month is a Tuesday. 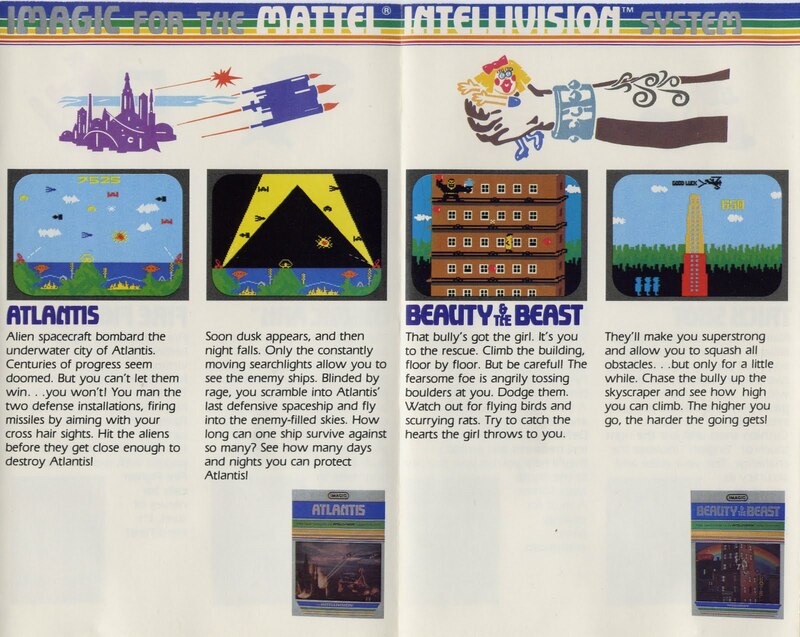 We're paging through the Imagic video game catalog from 1982, looking at the company's lineup for the Mattel Intellivision console. Pages 4 through 7 are now up for inspection, so let's get to it. 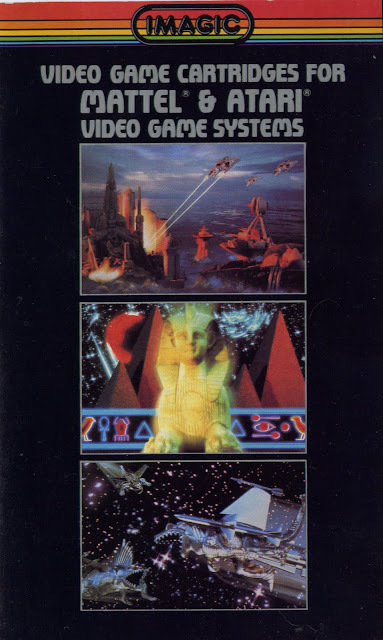 Atlantis, like Demon Attack, was an Intellivision version of a popular Atari 2600 title, and took advantage of the Intellivision's additional horsepower to provide a more detailed background and a night-attack mode, with searchlights outlining the darting alien ships. Beauty & The Beast was one of Imagic's most derivative games, clearly inspired by Nintendo's Donkey Kong but coming to market before Coleco's official adaptation for the Intellivision. It's much nicer-looking than the Coleco game for the same platform, and changes up the play dynamics a little bit by using windows instead of ladders to ascend. But the giant ape throwing boulders at our running and jumping hero out to rescue his girlfriend is a little... um... see where the catalog copy asks the player to "see how high you can climb"? Clearly unique and different from Nintendo's "How high can you go?" At least that's what I'm sure Imagic's legal department would have asserted. Microsurgeon is one of Imagic's best-remembered Intellivision titles -- the Fantastic Journey-esque concept of piloting a surgical robot probe inside a fully mapped-out human body was, again, a concept that would never have worked technically on the Atari platform. Designer Rick Levine's concept was unique and fresh, even in an era when wild experimentation was the order of the day, and had enough medical credibility to feature gallstones, tapeworms, and cholesterol, among other ailments. 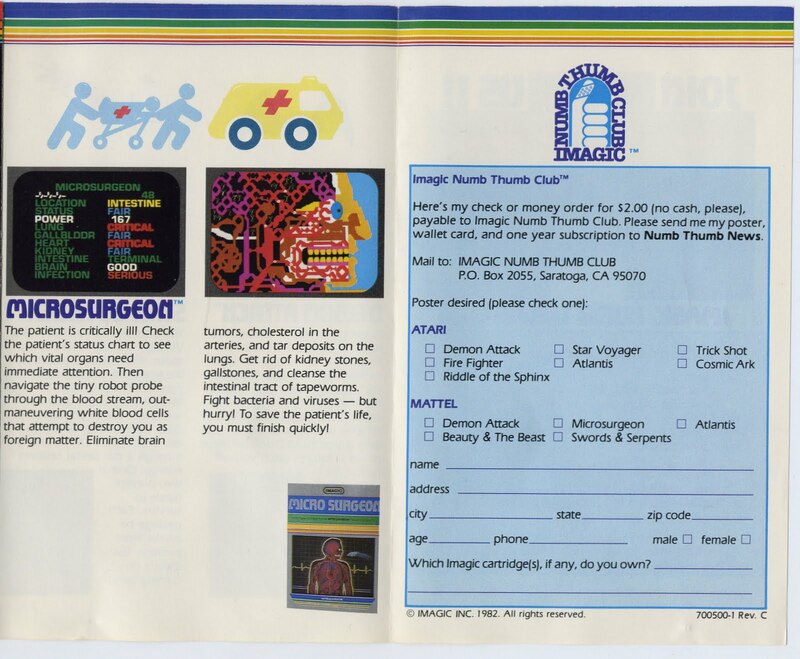 The Intellivision section closes out with a subscription flyer for the Imagic Numb Thumb Club, which wasn't as imaginative as Activision's coveted high-score patches, but allowed players with $2.00 to spare to get a game poster, wallet card, and one year's subscription to the company newsletter, the Numb Thumb News. I wonder if many of the offered game posters survive -- they would be interesting if not terribly valuable collectibles today, though one imagines some would be rarer than others. 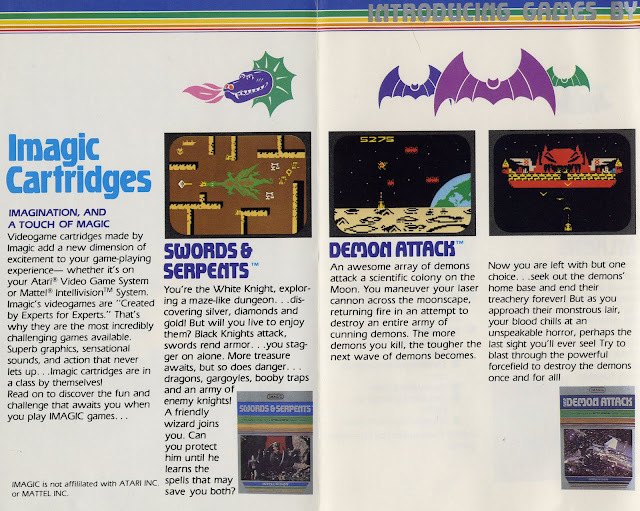 Next weekend, we'll flip the brochure over and look at Imagic's Atari 2600 titles, most of which are better-remembered than their Intellivision games. Reader response to this "Cover to Cover" series has been positive, so I've rummaged around in my vintage ephemera to come up with another old catalog we can page through for sheer nostalgia's sake. It's the 1982 Imagic catalog of cartridges for the Mattel Intellivision and Atari 2600 consoles! As we open the fold-out catalog/brochure to pages 2 and 3, we find ourselves looking at Imagic's Intellivision lineup. The copy invokes the company's "Created by Experts for Experts" tagline, and promises Superb graphics, sensational sounds, and action that never lets up. Which, by the standards of the day, Imagic arguably delivered. Swords & Serpents was a game that the Atari 2600 just could not have handled -- Mattel's 16-bit (yep! ... though memory was still a severe limitation) console had a true background layer and sprites that made this overhead-perspective dungeon crawl feasible. It even supported a second player, handling a wizard character while player one handled the brave knight. Of course, there was no save game capability, or password function, so one had to tackle this game's large map in one sitting. And the dragon appears only at the end of the game, so the screenshot used here (and in most of the advertising) is kind of a major spoiler. Demon Attack for the Intellivision was an enhanced version of Rob Fulop's legendary Atari 2600 cartridge -- while it was not as colorful, and the enemies seriously lacked variety in comparison, it did establish visually that we are fighting demons... in space!... and added a mothership battle patterned after the one in the arcade game Phoenix. This might be the first "boss battle" ever seen in a home video game, but don't quote me on that. Of course, when we've defeated the mothership to "destroy the demons once and for all," we just return to the first level where some new, more difficult demons have just arrived from out of town. Tomorrow, we'll continue our new journey forward, into the past! 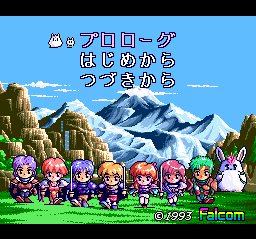 Falcom produced quite a few action RPG's during the 8-bit era, notably Faxanadu on the Famicom/NES, and the Ys series for the Sega Master System and PC Engine/TurboGrafx-CD, renowned for its music and fully-voiced, animated cutscenes. 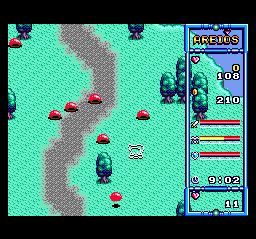 The Legend of Xanadu, published in 1993 on NEC's PC Engine Super CD-ROM format, features similar production values. But it never came to North American shores, so this week we're taking a look at the Japanese edition. Like the Ys games, this is more of a wilderness adventure than a traditional fantasy tale -- Areios lands onshore near a small community, talks to the villagers and learns of (what I presume is) a dire tragedy in the making, should he prove unable to bring his heroic skills to bear. Some of the conversations are fairly long-winded, or at least that's what I thought as I clicked dumbly through the Japanese dialogue before realizing that sometimes we have to pick between two conversational options to make progress. Finally, with the storyline set into motion, we can get out of town and kill us some monsters. The battle system is the same collision-based love-it-or-deal-with-it mechanic familiar from the Ys games -- we have to physically run into our foes using the control pad, hitting them with our sword-wielding side, while not hitting them so directly that they are able to damage us in return. 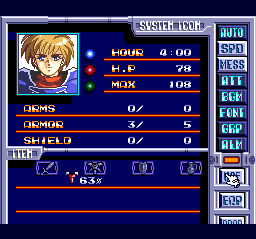 But the enemies tend to travel in packs more in this game than in the world of Ys, making it difficult to single one out from the bunch and run into it enough times to kill it without getting surrounded and killed ourselves. When we're not in conversation, a large heads-up display occupies one side of the screen r the other, switching positions depending on where Areios is headed... or not; it's a little distracting but one gets used to it. 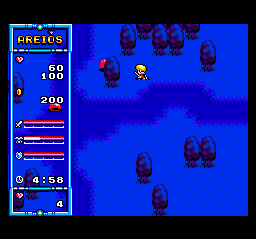 Interestingly, after Areios runs out of hit points and passes away, he still exists as a ghost, and can fly through walls and over obstacles to explore the world. But I wasn't able to find a way to restore him to flesh-and-blood humanity -- there probably is one, but without the necessary language skills I completely missed any clues of that sort -- so after playing Casper long enough to tire of it, I had to start over. I usually run into a wall at some point when I try to play JRPGs in the original Japanese. While it's possible to muddle through the game, fighting monsters and discovering new villages and lands, without some basic grasp of the story it's hard to care very much about what's going on. The Legend of Xanadu is quite nicely done, clearly an evolution of the Ys games with new features and more varied design. But it's also very much the same sort of story one expects -- there will be a series of increasingly difficult battles, we will face down an evil overlord of some kind, and the credits will roll. Maybe I'm just getting curmudgeonly and impatient in my old age, but once I can see the road ahead with some degree of clarity, and realize that I'm not going to get much of the story with equal clarity, I'm ready to experience something else. The Legend of Xanadu has been sampled. Next! 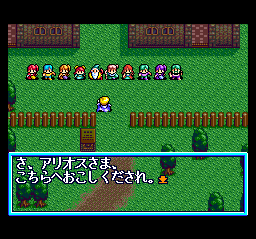 If you understand Japanese, you might get a lot more than I did out of this rich, polished JRPG. You may be able to find a copy for purchase here. Ed. : It's time once again for the monthly Ultra Review Roundtable, lovingly assembled by HagenDragmire at www.vgmastersclub.com with contributions from our motley crew of retro gamers (including yours truly, Sushi-XPired.) This month, we turn our attention to the Game Boy, and Konami's Kid Dracula! Kid Dracula on the Game Boy is a platform game and the follow-up to the Japan only Famicom game Akumajo Special: Boku Dracula-kun. The story has the Demon Prince, Kid Dracula awakening from a deep slumber and getting challenged by Garamoth who is a dinosaur-type creature. Being the cocky kid that he is, Kid Dracula ends up deciding to take on Garamoth all by himself. A little tidbit is that the Kid Dracula in this story is essentially the child version of Alucard from Castlevania: Symphony of the Night fame. Not only did all the 8-bit Japanese Castlevania titles start with Akumajo, but Garamoth also appears as a boss in Symphony of the Night, called Galamoth. Kid Dracula’s gameplay is your stereotypical action/platform game. The controls are decently accurate and don’t require too deep of a learning curve in order to jump right in and play. The addition of special powers and being able to charge them for an added boost gives you options to how you can tackle every obstacle throughout the game. Boss fights are fun and the attack patterns aren’t too overly cryptic. The graphics are decently detailed for a Game Boy release. All of the characters in the game have a special charm to them which makes them each likable in their own way. Each level has a different theme which is nice to see on the monochrome handheld. The music is quirky as expected and adds to the charm created by the graphics. Overall, the presentation here makes for a great overall gaming experience that Konami is known for. "Kid Dracula? I wouldn't go teasing vampires if I was you, sonny. Them bloodthirsty bastards'll tear your throat out soon as look atcha. Why, when I was a boy, if you dropped a penny in the dark, you didn't bend down to pick it up, for fear that some unholy creature of the night would swoop down out of the trees and sink its eight-inch fangs right into your neck. Leastways, that's what they told us kids. No wonder my generation is all messed up." This girl is cute enough, but she’s kind of a witch. Kid Dracula is a cute, cartoonish, thoroughly Japanese spinoff/parody of Konami's Castlevania series, and it wears its black but jovial heart on its sleeve. There's probably more space devoted to sprite animation than background tiles in this Game Boy cartridge. The zombies, bats, Frankenstein's monsters, and other monstrous denizens of its short, platform-heavy levels are rendered with big heads and bug eyes, with comical expressions as they get taken down. And our hero Kid Dracula whisks his cape around and flashes a cheeky, triumphant grin at the end of each section. The end-of-level boss battles are a lot of fun and are sometimes pretty challenging, with multiple forms for each boss giving them a great sense of humor. 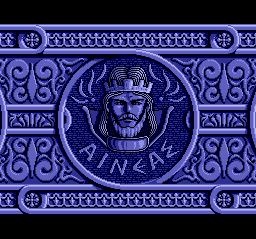 The game also benefits from one of Konami's lively, light-hearted 8-bit music scores. I found Level 2's bouncy theme maddeningly recognizable and had to track down its origin. I thought for a while it was from an early Konami arcade game but the closest match I could come up with was the theme from Toypop, which was from Namco and not the right tune either. The Web eventually took pity and informed me that it's actually a Debussy piece called "Golliwog's Cakewalk" which was familiar to me because it has been borrowed for a number of silent movie organ scores. (No, I am not actually THAT old!) It fits the style of Kid Dracula perfectly. Kid Dracula is a pseudo sequel, or quasi-port, or maybe even a partial demake of Konami's Japan exclusive Famicom title Akumajo Special: Boku Dracula-kun. Staring a chibi super-deformed version of the Castelvania III's Alucard, Kid Dracula's pitch perfect parody of the series to which it owes its lineage gives the title a fistful of charm that precisely accentuated by its decidedly Japanese graphical style. My copy of Kid Dracula. You play as the titular Kid Dracula, Alucard, and platform your way through stages that expertly blend design cues from the NES Castlevania titles with the varied and creative level design reminiscent of the early NES Mega Man games. Like Mega Man, conquering stages nets you additional power-ups and special abilities you must use to pass later stages. 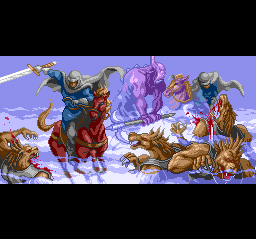 The bosses are a highlight of the game without a doubt, with each offering a varying degree of strategy and technique to overcome. All in all, although the game is a bit on the easy side, certainly compared to its Famicom sibling. Kid Dracula definitely deserves a place in any serious video game enthusiast's collection. My experience with Kid Dracula goes back to my childhood and my complete lack of knowledge that led to me not knowing I could turn into a bat until I read retro review in a European Nintendo magazine in early 2003, needless to say I was pissed. However for some reason Kid Dracula has stayed with me throughout my youth, proudly and somewhat arrogantly on my shelf as a game I've never quite completed. I'd say this was down to lack of batteries, but in truth Kid Dracula is bloody hard once you get towards the end; especially if you didn't know you can transform into a bat. Much like my love for Parodius, Konami again parodied one of their finest franchises into a much more child friendly form. However looks can be deceiving, Dr Acula is at its heart a deeply difficult platformer with more trips ups than a broken set of stairs. For the concerned pedigree Castelvania fan you're right to be nervous, as Kid Dracula has very little in terms of homage to it's older bretherin. But forgiving that, this little platformer can give every portable Mario title a run for its money and in many cases beats them. It’s my opinion that Kid Dracula is one of the best portable platformers out there, with an all round brilliant display of graphics, gameplay design, and sound that it's difficult to really knock the game down. The enemies and bosses have been perfectly planned to give the gamer not only a challenge, but upon defeat a sense of accomplishment. Only falling short due to its gameplay length, it doesn't devalue the memories I have of this game or most importantly what an essential game this is. Kid Dracula is way harder than I remember from back in the day. When I was a kid I used to beat this game in a heartbeat, but now I’ve been having trouble on the third stage. This could be because I’m too lazy to get out my Super Game Boy with my copy of the game and I am playing it via emulation on my iPhone with the Wii controller via bluetooth. It took me a while to figure out that I could turn into a bat with select, as I kept dieing on the first level from longer jumps. Having all the different powers is really a great feature to Kid Dracula and all of the boss battles are pretty damn fun. I especially liked battling the Chibi-Jason who not only grabbed his ax but also a shotgun! The boss fights were a blast. After playing it again on the Super Game Boy, the controls are so much more responsive and precise then on the ROM version, which allowed me to progress a little further into the game. The music is great throughout and there are quite a few tracks for an original Game Boy release. Alucard has really grown up in latter games, but as a kid he was still pretty badass. I've previously written about a couple of the local arcades of my youth, and this week I'm going to talk about The Circus, the cleanest and longest-lived of the three. It was based in Marinette, Wisconsin, right across the river from my hometown of Menominee, Michigan, where it occupied a coveted spot near one of the entrances to the Pine Tree Mall. It was a boxy, ordinary sort of storefront layout, darkened in the usual manner to show off the games, and of course the usual suspects were present at various times: Galaga, Pac-Man, Donkey Kong, Tempest, and other well-remembered hits. But I remember playing several more obscure classic-era games for the first and possibly only time there: Exidy's Venture and Pepper II, Sega's Carnival, and Universal's Cosmic Avenger and Mr. Do!, all later seen on the Colecovision as Coleco sought semi-known names while Atari had the big ones locked up. I remember playing Taito's Elevator Action and Atari's Lunar Lander, Football and Fire Truck, which allowed my brother and I to slog through the streets, him at the main steering wheel, me swinging the rear section wildly into the scenery with repeated CRASH!! !es while homes burned and children died. The Circus also showcased several of the laserdisc experiments of the post-Dragon's Lair era -- Sega's shooter Astron Belt, and Williams' very odd laserdisc racing game Star Rider, which memorably featured a pre-rendered CGI racetrack, pixel-based cycles and a cameo from Sinistar. I don't remember The Circus very well after I went off to college in 1985 and stopped visiting it on a semi-weekly basis. I do recall seeing the Nintendo NES-based Vs. System cabinets there, and once dropped a quarter to play Konami's Castlevania, which was already looking a bit graphically limited next to the state-of-the-art coin-op competition. They had a Neo-Geo multigame cabinet when it was still the hot new thing, and I played early titles like Magician Lord a lot more than I probably should have. I also remember playing the coin-op version of Ghouls & Ghosts, looking a lot better than the otherwise decent 8-bit Nintendo port, and annoyingly used as the source of the screenshot on the back of the NES box, and mid-80s Konami action games like the Western Iron Horse, which never saw a conversion back in the day but finally came home via Microsoft's Game Room last year. The Circus went under some time after I graduated and moved away from the area; I don't know how long it actually survived, but I remember seeing it decline with the rest of the arcade industry, turning into a SkeeBall-heavy ticket redemption joint in the 1990s. It ultimately closed its doors, like most of the arcades that started big in the 1980s but eventually fell prey to changing tastes as more sophisticated home consoles offered deeper experiences than many of the quick-fix quarter-munchers could. I visited The Pine Tree Mall again several years ago -- it seemed near-defunct itself at that time, with lots of empty storefronts in the face of competition from newer shopping complexes that have since opened up nearby. It was the last of a breed -- a late-1970s indoor mall with quite a few local, non-franchised businesses mixed in with the Gap and Baskin-Robbins outlets -- and I used to shop regularly at its Radio Shack during my TRS-80 and CoCo days. Ah, nostalgia -- those inexplicably warm feelings for things past that shall never be again, reminding us that nothing lasts forever, not even our own memories. 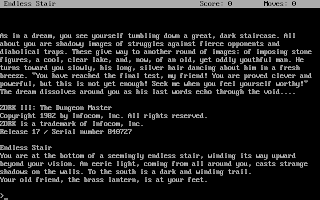 In memory of Bob "Captain 80" Liddil, who recently passed away, we're going to look at one of the earliest TRS-80 text adventures we've tackled -- The Lost Dutchman's Gold, written in 1979 by "Teri Li" (a.k.a. Terry Kepner) and published as the very first release from the late Mr. Liddil's company, The Programmer's Guild. Its opening screen uses the Radio Shack TRS-80 computer's double-width text mode, which was quite the impressive hardware feature back in its day. A technical aside -- if you're tracking this game down in the online Internet archives, be aware that the version called LSTDUT1A/BAS doesn't seem to work, and LSTDUT1B/BAS is much more reliable. There's a functional SAVE GAME command in this one, so you will probably want to play it on (real or virtual) diskette for the sake of speed. And if you're playing on an emulator, you might want to crank up the CPU speed a little bit, as this one's written in BASIC and doesn't always respond with haste. The Lost Dutchman's Gold was a pretty early microcomputer adventure game, following closely in Scott Adams' pioneering footsteps, but with an interesting stylistic difference -- the story is formally hosted by THE GHOST OF BACKPACK SAM. Usually there's no personified narrator in these games, and this character lends a little freshness to the experience; I like to picture this one as an ethereal Gabby Hayes. As the game begins, we find ourselves in a vintage gold rush setting, standing in a miner's shack with limited supplies. It seems that we can't really do much, either, which led me at first to speculate that perhaps we are also a ghost, or that the parser is very, very limited. But eventually I figured out that the engine is simply case-sensitive, dating from the early TRS-80 days when no lowercase character set was available, and only responds to uppercase input. We need to use INV (with optional additional letters) to check our inventory, not I. And my initial SCORE attempt yielded YOU CAN'T, YOU'RE IN THE WRONG LOCATION! So there's one puzzle -- we have to find the right place, which turns out to be the saloon in town. The game calculates our score as both a count and percentage of the available treasures; there are only four in this relatively brief adventure. From inside the miner's shack, GO WINDOW and GO DOOR both lead to the same location on a dirt path. Once we leave the shack, it initially appears to have been a one-way trip, but I eventually figured out that we can GO MINER'S to get back inside. There's an old, weary grey mule standing outside the shack, and the local landscape is dominated by a desert that doesn't map in any interesting fashion -- we can just go W from any of its three locations to return to the DIRT ROAD. The desert "rooms" are distinguished by the type of cactus growing in each -- cholla, barrel and saguaro -- but the varying vegetation isn't meant to provide any clues or puzzles. Navigation is pretty straightforward and naturalistic, with GO [place] and GO [direction] often both available -- GO ROAD leads us through the desert to a town in the distance; GO PATH leads back to the shack. We can DIG, of course, which usually just yields DAG NAB IT! THERE'S NOTHIN' HERE! Objects we can't TAKE yield JUST WHO DO YOU THINK YOU ARE, PAUL BUNYON? [sic] YOU'RE NOT STRONG ENOUGH, even when the item is fixed in place but not actually heavy. The TOWN IN THE DISTANCE proves to be a GHOST TOWN upon closer inspection. READ SIGN yields WELCOME TO FRONTIERTOWN, which sounds more like a theme park than a Wild West settlement. Perhaps it's one of those planned communities. The local saloon contains quite a few interesting props -- whiskey bottles, paper, broken glass, tables, and chairs. We can LOOK TABLES to find a set of keys, specifically THREE KEYS, TIED TOGETHER WITH A LEATHER STRAP. READ PAPER promotes upcoming titles, but the Programmer's Guild name isn't quite established in this early effort -- it reads, WATCH FOR OTHER RIDER FANTASY CREATIONS ADVENTURES. And we can, of course, DRINK WHISKEY, producing WHEEEEEE ! YOU GOT PLASTERED AND LOST A DAY., without any other obvious ill effects. LOOK WHISKEY is more useful, discovering a BOX OF RIFLE BULLETS. Now we can LOAD RIFLE - WITH WHAT? - BULLETS (not BOX, mind; in this instance, the game's vocabulary is properly handled by early text adventure standards.) Now, if we like, we can discover that SHOOT MULE turns the poor animal into a DEAD MULE, but LOOK MULE still responds, YOU SEE AN OLD, WEARY GREY MULE, neglecting to mention the creature's sudden decline in health. GO MOUNTAINS outside of town leads us to THE BASE OF THE SUPERSTITION MOUNTAINS, and the treasure-hunting portion of the game. HELP at the base of the mountains actually produces a helpful response -- TRY 'FOLLOW'. And FOLLOW ROAD (if we have the map) gets us to someplace new, THE BASE OF WEAVER'S NEEDLE. Here we find a PILE OF BONES (MINE) -- per the Ghost of Backpack Sam, naturally -- and LOOK PILE reveals that it LOOKS LIKE THERE'S GLASS UNDER 'UM, producing the customary adventure game staple, a LANTERN. North of Weaver's Needle is a NARROW DEFILE, with bushes and caves, plus a little casual vintage racism: THAR'S NOISE UP AHEAD - - SOUNDS LIKE INJUNS. Fortunately, the Native Americans never actually intrude on the action, so we aren't forced to make any ethically questionable decisions. Instead, we can simply travel further north to a BOX CANYON, featuring boulders arranged as they are on the map. We can FOLLOW BOULDERS to reach A PARTIALLY HIDDEN MINE, and GO EAST from here to enter said mine, easy to do as the mine is only partially hidden. The mine entrance has the standard-issue burlap sack, ore cart and mine shaft. The parser breaks down a bit here -- we have to call the sack BURLAP, not SACK, which is inconsistent with the game's other, generally sensible usages. We do need to LOOK BURLAP to find some MATCHES inside, very useful for actually lighting the lantern. It's a good time to SAVE GAME here, as a RATTLESNAKE lurks in the dark as we enter the mine, and we are bitten and killed immediately if it didn't occur to us that it might be dark inside the mine. If we have the lantern lit upon entering, the snake doesn't seem to show up at all. There's a LOCKED IRON DOOR at the end of the tunnel, which we can open easily with the keys from the saloon. Beyond the door, we find a large chamber with crates, and one of those unpredictable adventure game cave-ins occurs, so we will need to find another exit. LOOK CRATES yields a note, saying BRING TREASURES TO SALOON, AND SAY SCORE, if we haven't already figured that out; remember, these were all new conventions when this game was written. In keeping with another classic adventure game trope, the lantern runs low over time, with Backpack Sam telling us YOU'RE RUNNIN' LOW ON KEROSENE with no indication of just how much time we might have left. We can UNLIGHT LANTERN to conserve fuel; we can't really navigate safely in the dark, but if we play efficiently it's not necessary to do so. In the mine, we can DIG more productively -- in a dead-end tunnel we find some # SILVER #, and there's # GOLD # in them thar nearby location to boot. We also have to GO DARK in the mine to enter a DARK HOLE and collect the * TOURQUOISE * [sic] treasure down there. We also have to include the treasure-denoting punctuation when referring to these things, for the parser's sake -- we need to GET * TOURQUOISE *, for example, not GET TOURQUOISE. Inventory juggling becomes a bit of a challenge at this point in the game -- I discovered to my dismay that I should have kept the keys to deal with a LOCKED TRAP DOOR on the lower level, instead of dropping them somewhere back beyond the range of my remaining lantern fuel. And we can't CLIMB LADDER or GO DOWN once we're at the point of dealing with the trap door, anyway. Ack! But I was relieved to discover, after a restore, that the trap door leads back to the familiar territory of the miner's shack, though it only goes one way. I was less relieved to discover that if we have dropped the map after finding the lost mine, we can't get back to the mine to pick up any treasures we failed to liberate on the first visit. And I was downright irritated to discover a maze in the mine as well that goes nowhere! Once we've entered the maze, standard mapping technique establishes that N, S, E, and W all return to the same room; we just need to avoid this part of the map. Time for the usual endgame -- we drop our four treasures in the saloon, say SCORE, and we're done! I enjoyed playing The Lost Dutchman's Gold, thanks in large part to its colorful, naturalistic setting. It does feel a little unfinished -- the "injuns," the desert, the rattlesnake and the crates never really resolve into anything interesting. 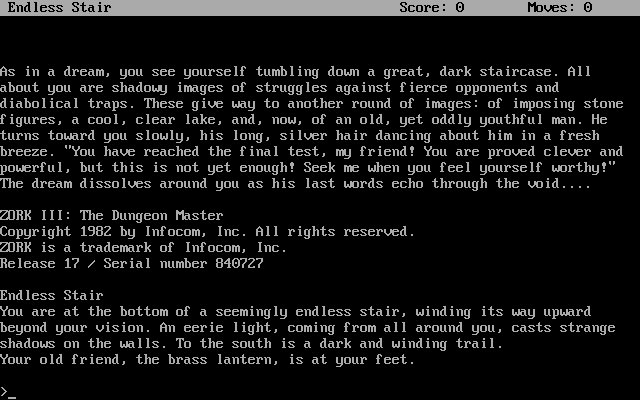 But Terry Kepner's game is a fun little text adventure from the very early days of the genre. Monday morning cord-in-back... unless you're on Wi-Fi, as most people seem to be, so that joke is already way out of date... and there's not a lot going on this week. Maybe summertime really IS the slow season for game sales. WiiWare -- One new title this week -- Digital Leisure's Overflow, a physics-based puzzle game reminiscent of the old Sierra Incredible Machine and Lucasarts' Pipe Dream games. Wii Virtual Console -- Nothing happening here this week. DSiWare -- Three new titles up for download. The excellent Puzzle Quest: Challenge of the Warlords, previously available on DS card, is now available as a downloadable title. 99 Bullets is a retro-style scrolling space shooter. 3D Twist & Match is a visualization challenge, asking players to rotate a 3-D object to match a presented silhouette; I wonder if this one will also show up on the 3DS, since it sounds like the gameplay might or might not benefit from a little depth perception. XBox Live Arcade -- One new game, Sega Rally Online Arcade, a semi-new entry in the classic Sega Rally series, with online multiplayer and sharp-looking graphics. PS3 on PSN -- Another quiet week. Some titles are still expected this month... hopefully next week! PSOne Classics -- Dormant again this week; it's been a month since the most recent release in North America. Okay, I think we can wrap this one up today. 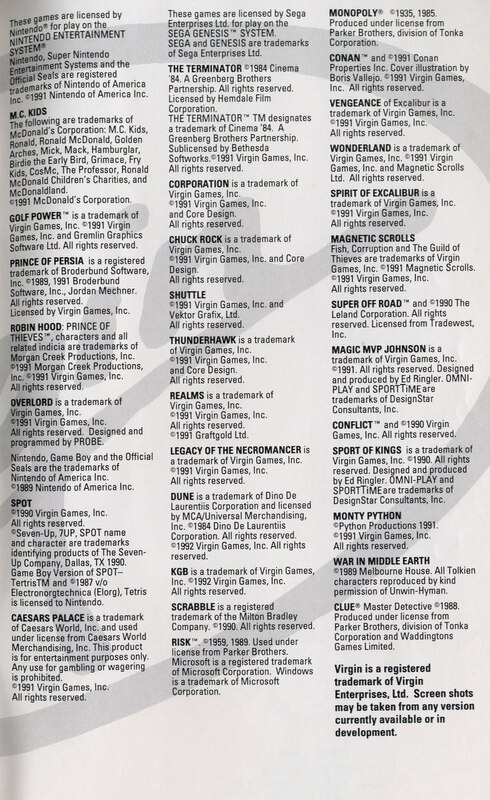 Virgin Games 1992 catalog was 24 pages plus the order form, so this has been a fairly lengthy journey. I hope it has been interesting -- old game catalogs are time capsules that I always find fascinating, as so many details and titles are lost to time and fading memory. 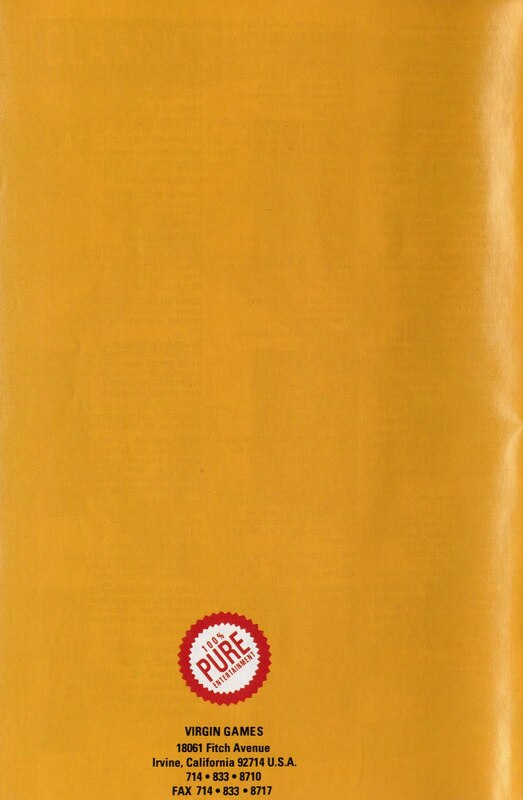 These last few pages comprise the vintage part of the catalog, focusing on Virgin's Classics, i.e. titles that have been in circulation for a while but are still marketable, sometimes at reduced cost, or that are currently more marketable in console form. 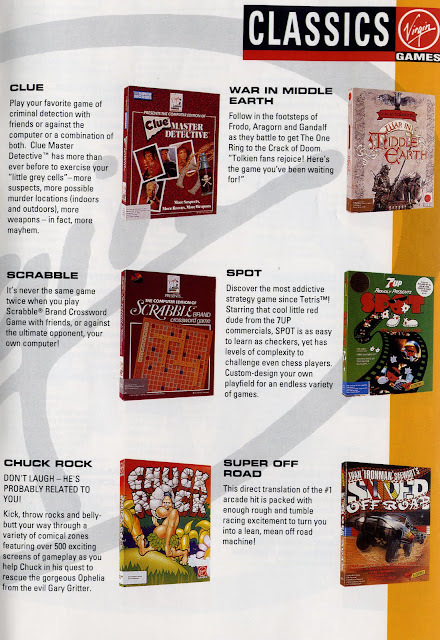 The titles on page 21 are given box art and descriptions, starting with adaptations of the classic Clue (with an expanded game board) and an earlier Scrabble title, not yet superseded by this catalog's Scrabble Deluxe. The original Amiga version of Chuck Rock (also available for the Sega Genesis) is here, along with the older Tolkien-inspired strategy title War in Middle Earth, 7-Up game Spot (also on the NES and Game Boy), and multiplayer arcade port Super Off Road. Page 22 is similar, with generally brief descriptions. We are offered the strategy game Conflict, which bears certain resemblances to Risk, and gambling simulation titles Caesar's Palace, Casino Spectacular, and Sport of Kings, foreshadowing Virgin Games' present-day business model. The Monty Python game is an odd duck, featuring Terry Gilliam's animated graphics from the classic Flying Circus television show, thrown into a rather generic 2-D action game. And while Magic MVP Johnson sounds like a fantasy game or Leisure Suit Larry imitator, it's just another largely-forgotten licensed basketball title. 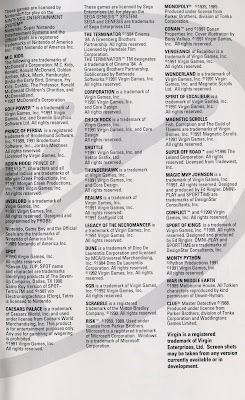 The inside back cover, page 23, covers all the necessary legalese associated with the many licensed products in Virgin's 1992 lineup and the company's own trademarks -- if we care to examine it closely, we can remember that, for example, Super Off Road was originally a Leland Corporation coin-op arcade game, and see a fairly comprehensive list of McDonaldland characters. 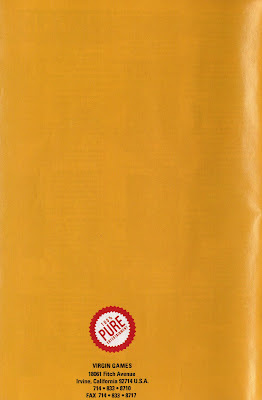 The back cover is just the back cover, with a "100% Pure Entertainment" seal and the address of Virgin Games' U.S. subsidiary. 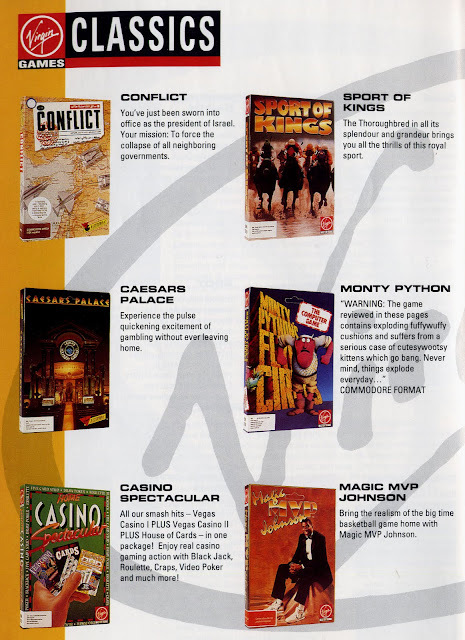 And that's it for Virgin Games, circa 1992, as documented in the company's consumer literature. The company survives today primarily as an online gambling concern, and was arguably near its artistic and commercial peak when this catalog was in circulation. Consider it more evidence, as if any is needed, that the only constant in the game industry is change.